It’s been just a few days, but we have our first BIG winner at Fly Casino for $19,452.59. Wait for it…on her 11th spin! Danny and Sandy are here to thrill you as you dance to the music of Grease at Omni Casino! You’ll step back to Rydell High and join many of the most beloved characters from this mega musical hit as you sing along to the music taken from original soundtrack. It’s a 5-reel, 20-payline slot machine. Along with standard wins created when you land three or more matching symbols; this game is packed with a few re-spins, stacked wilds, random wilds, pick a prize rounds, a selection of free spins and two progressive jackpots! Landing stacked Danny or Sandy symbols on reel 1 triggers the Rockin’ and Rollin’ Re-spins feature. The symbol landed stays locked in place as you spin 3 times. As you play any other triggering symbols, plus any wilds, lock and grow your potential winnings. Really fun! Totally random as you play, if triggered you’ll be hitting some nice cash! During a random spin the game will add up to eight wilds to the reels. Occur often enough to keep you on the edge for it. The Grease logo landing on reels one, three and five will initiate the main Jukebox bonus feature. Three jukeboxes are displayed whereby you can decide which bonus round you want to enter. It’s a little hard to land, but when you do…cash awaits. Choice #1 The Better Shape Up free games is 12 free spins with the lower-value paying symbols removed from the reels. Any Danny or Sandy symbols will convert into the symbol of them together throughout this feature, which should lead to some bigger wins. Choice #2 The Summer Nights free games, you get just four extra spins! But the Sweetheart Wilds feature will play during each spin adding up to eight wilds per spin. This can be mega stuff, but you’ll be short on spins. Choice #3 Pick the Rydell High feature and you will see a school yearbook filled with photos of the cast. Pick a photo from the five on the page to get a cash prize. Then pick another photo, after which the page can turn over to reveal five more pictures for you to pick from. This goes on for a total of five rounds, with increasing rewards on each page. But, you can run into that dreaded collect. Although, we did really well most times and even when all the way to the end. 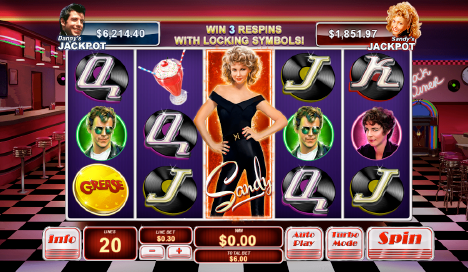 After any spin, one of two Greased Lightning progressive jackpots can be triggered. A special round starts whereby Danny and Sandy are standing to either side of a red curtain filled with 12 Grease logos. Start picking logo symbols. When you find three pictures of Danny or three of Sandy, you’ll win their corresponding jackpots. 133% BIG TUESDAY! From 00:00GMT until 23:59 GMT, all members on their deposit of $/£/€50 or more will receive a 133% bonus up to $133.00 bonus.